In order to ensure the quality, efficacy and safety of synthetic drugs, research activities of the division are focused on the following areas: (1) biopharmaceutical evaluation of drugs including bioequivalence tests, (2) relation of genetic polymorph with drug disposition, (3) evaluation of the physical and chemical stability of pharmaceuticals, (4) pharmaceutical properties of special dosage forms including drug delivery systems, (5) quality assurance system and validation for Good Manufacturing Practices (GMP), and (6) new analytical methods. 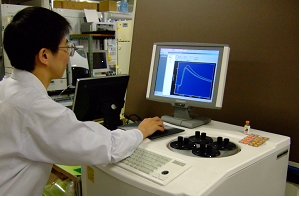 The division has contributed to establish drug standards and general tests in Japanese Pharmacopoeia and other official books. The education and training of GMP inspectors is also our mission. 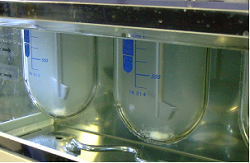 Dissolution of drug from a tablet is measured in a simulated digestive fluid in a beaker to investigate the relation with drug absorption. 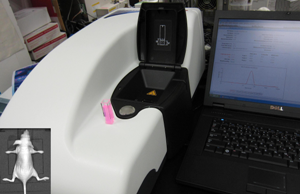 Heat flow generated from tablets is being measured using microcalorimetry to predict the shelf life. 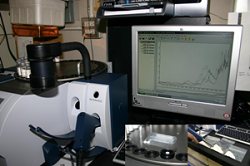 Pharmaceutical active ingredients, excipients or water content of products are characterized using rapid and non destructive near infrared spectroscopy. The relationship between the physicochemical properties of drug formulations and the biodistributions is studied.